The Stage Could a theatre workshop open doors to a hit musical or play? Could a workshop open doors to a hit musical or play? 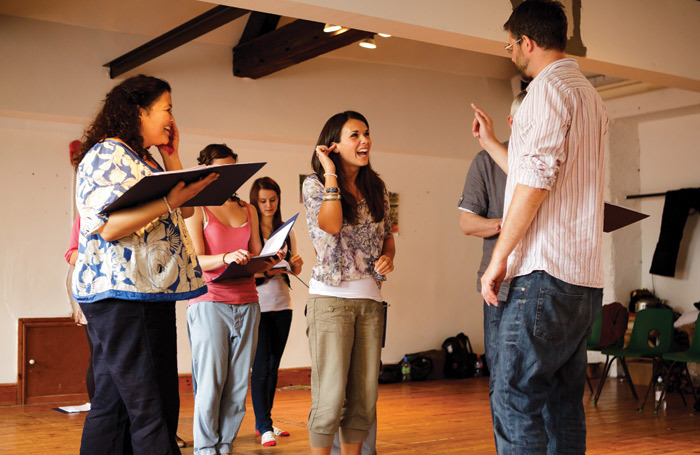 Whether you’re a producer, writer, director or a performer, the odds are that at one time or another you’ll be involved in a workshop of a new play or a musical. Even if the money isn’t great, they’re still a useful way to put your marker on a project as a director or on a part as an actor in case the piece gets fully produced. If you’re a writer, they often provide fresh perspectives, but, more crucially, they’re a necessary hurdle to get over to reach full production. If you’re a producer, they’re a chance to try something out without committing too much money. For everyone, they’re a good networking opportunity, a workout for your talent and CV fodder. Like so much in our business, as a performer getting involved in a good workshop is all about connections to the right people. Facilitators tend to round up artists already established or known to them. But sometimes workshop jobs are advertised and there’s a chance to audition. It would definitely be worth dropping a note to your agent, casting directors or producers to say you’re interested in participating in one. Workshops take many forms, but you can expect to spend anything from a fortnight to a day on them, depending on the status of the project. A week is normal. Ten days to two weeks isn’t uncommon for new musicals because nothing much can be discovered about the piece until the performers have been taught the songs, which is more time consuming. Why shouldn’t the piece be the next international smash hit or Pulitzer Prize winner? There’s unlikely to be time for any “meet and greet” or “getting to know you” games, everyone usually plunges straight into working with the material, but all will be in high spirits because why shouldn’t the piece be the next international smash hit or Pulitzer Prize winning dramatisation of an important issue? After the first day of fevered activity it will certainly feel as though it is. There will be a read/sing-through then the rest of the time will usually be spent working up some kind of presentation either for the venue or commercial producer who has commissioned it or is paying for the project. As a rule of thumb, if a new piece doesn’t have a producer or venue interested ahead of the workshop, it’s very unlikely to attract one. As part of this process, changes may be made to the script or libretto if they are deemed not to be working, but usually everyone is so hell-bent on making the presentation good enough to get them a job or a full production that there’s not much time for this. The performers work from the script and it’s very rare that anyone is required to learn lines. A lot of performers do, but this can be detrimental to the presentation because half-recalled lines can then be paraphrased in cautious performances rather then read accurately and confidently. For a musical it is worth learning big solos. Everyone has a much better time if you can really let rip and it’s easier to commit lyrics to memory. The performers often stay quite chilled because, although they will want to do their best to impress the potential employers involved, the focus is usually on the material and performances are a secondary consideration. But don’t make the mistake of thinking the casting and performances aren’t important. I’ve seen really great scripts fall flat when there’s no spark between actors. Nobody wants to find themselves saying or hearing “Well, of course that scene would have worked if the two actors had some chemistry” (or could hit the notes). Writers, do not be tempted to workshop or present a half-finished work or anything that requires the spectator to make allowances. In my experience, commercial producers who have financed or commissioned a script or musical are both desperately hoping it will be good while secretly hoping it will be bad so that they won’t have to spend anything further. Any defect, no matter how easily correctable, gives funders the excuse they’re looking for not to commit. It’s not unusual for writers to be left hanging and to never hear from these timorous beasts again. Some very well-known producers are notorious for this, leaving a trail of bewildered writers, at every stage of their careers, on the brink of nervous breakdowns. If there’s no presentation involved, it can be fun to mess around with bits of a new script, and there’s a whole industry of facilitators who will claim to ‘fix’ your writer’s block or work in progress. However, if you haven’t finished your play or musical, consider whether your time might be better spent doing so. Lastly, if you ask for feedback make sure you can handle it. Give a workshop audience a feedback form and anonymity and they go power crazy, so if you’re not used to inflated praise or cruel abuse – and you will get both – it can send you spiralling in the wrong direction. Learn to sift calmly through feedback forms to get a consensus. Live discussion of the work after the presentation is also tricky, as the bold and opinionated will dominate the session and colour your thinking and you’ll hear little from those quietly formulating a more considered response.